Creating Gaseous Micro Environments for Packaged Produce to Maintain the Quality of Fresh Fruits and Vegetables. Even for locally-sourced produced with reduced food miles, it is important for suppliers to ensure the maximum quality and freshness for their produce. This is because without careful storage for transportation, the vitamin content of fresh foods can deteriorate3 as well as the appearance of the produce, making it more difficult to sell to consumers. One very successful approach to preserving food quality during transportation and storage is the use of gaseous microenvironments in food packaging and storage. This is known as modified atmospheric packaging (MAP), or atmospherically modified package (AMP), where the foods are packed in containers with an environment of carefully-controlled gas concentrations.4 A huge number of the foods we buy make use of MAP to enhance their freshness and shelf lives without the need to add preservatives or modify the food itself in any way. Transportation of fruit and vegetables is usually performed under refrigerated conditions, regardless of the means of transport, typically around 5°C with carefully controlled humidity.5The chilled conditions help to slow the growth of any microorganisms and extent the lifetime of the food, in conjunction with the use of MAP. Such careful control of the environmental conditions for optimum fruit and vegetable preservation during transportation relies then on highly-sensitive gas sensors capable of distinguishing the smallest of changes in gas concentration. The typical gases used in MAP for fresh fruit and vegetable preservation are CO2, O2 and sometimes N2. Edinburgh Sensors offers a range of gas monitoring options well-suited to ensuring optimum gas conditions during fresh food transportation. Their range of CO2 online monitoring sensors includes the Guardian NG10, Gascard NG11, the IRgaskiT12 and the Gascheck13, will cover most customer needs for food transport applications. Where low-cost, highly-robust gas monitors are desirable, the Gascheck is an ideal option. Capable of detecting CO2 concentrations in the 0-3000 ppm range, with a zero-stability of ± 3 % over 12-months and an accuracy of ± 3 % over the full detection range. Depending on the particular version of the Gascheck, the response time can be as low as 30 seconds, with an initial warm-up time of 5 minutes. Where higher accuracy is desirable, the Guardian NG comes in a range of options with an accuracy of ± 2 %. The Guardian NG also has a convenient interface which displays true volume % readout over a wide range of pressures as well as being capable of displaying historical graphical information over a user-defined period. If necessary, there are built-in alarm systems to warn if gas concentrations deviate too much or the possibly to connect and interfacing with external logging devices. The Gascard NG comes now in two versions, either as the stand-alone card, or as the Boxed Gascard14 to minimise installation and set-up time. The Gascard is capable of detecting CO2 concentrations in the range of 0 – 5000 ppm and, like the other Edinburgh Sensors products, can also operate in humidity conditions spanning 0 – 95 %. By using RS232 communications the Gascard can be integrated with other control or data logging devices, also with the option for on-board LAN support where required. Edinburgh Sensor’s full range of instruments comes with both pre- and post-sales technical support and these devices build on their nearly 40 years of expertise in a range of gas sensor technologies. Most of these products are based upon infra-red detection, which facilitates their very high sensitivities for gases such as CO2 or other hydrocarbon species like methane and in systems like the Boxed Gascard, the infrared source is field-replaceable. Online monitoring of gas concentrations for MAP applications allows maintenance of optimum conditions for fresh fruit and vegetable preservation, which is highly beneficial not just for ensuring better quality produce, but also ensuring less food spoilage and wastage and the cost-savings associated with this. 3. M. I. Gil, F. Ferreres and F. A. Tomás-Barberán, J. Agric. Food Chem., 1999, 47, 2213–2217. 8. S. Mangaraj and T. K. Goswami, Fresh Prod., 2009, 3, 1–33. 9. A. A. Kader, D. Zagory and E. L. Kerbel, Crit. Rev. Food Sci. Nutr., 1989, 28, 1–28. The world of virtual commissioning. Robert Glass, global food and beverage communications manager at ABB explores the concept of virtual commissioning and how system testing can benefit the food industry. Industry 4.0 continues to open up new opportunities across food and beverage manufacturing. In particular, these technologies help improve manufacturing flexibility and the speed and cost at which manufacturers are able to adapt their production to new product variations. Virtual commissioning is one of these key technologies. Shan Zhan, global business manager at ABB’s food and beverage business, looks at how blockchain* can be used to enhance food traceability. A report from research consultancy Kairos Future describes blockchain as a founding block for the digitalization of society. With multinationals such as IBM and Walmart driving a pilot project using blockchain technology for traceability, the food and beverage industry needs to look at the need for the protection of traceability data. Food fraud is described by the Food Safety Net Services (FSNS) as the act of purposely altering, misrepresenting, mislabeling, substituting or tampering with any food product at any point along the farm-to-table food supply chain. Since the thirteenth century, laws have existed to protect consumers against harm from this. The first instance recorded of these laws was during the reign of English monarch King John, when England introduced laws against diluting wine with water or packing flour with chalk. The crime still exists to this day. While malicious contamination intended to damage public health is a significant concern, a bigger problem is the mislabeling of food for financial gain. The biggest areas of risk are bulk commodities such as coffee and tea, composite meat products and Marine Stewardship Council (MSC) labelled fish. For example, lower-cost types of rice such as long-grain are sometimes mixed with a small amount of higher-priced basmati rice and sold as the latter. By using blockchain technology in their traceability records, food manufacturers can prevent this from happening. Blockchain is a type of distributed ledger technology that keeps a digital record of all transactions. The records are broadcasted to a peer-to-peer (P2P) network consisting of computers known as nodes. Once a new transaction is verified, it is added as a new block to the blockchain and cannot be altered. And as the authors of Blockchain Revolution explain, “the blockchain is an incorruptible digital ledger of economic transactions that can be programmed to record not just financial transactions but virtually everything of value”. When records of suppliers and customers are collected manually, to ensure the end manufacturer can trace the entire process, this does not protect the confidential data of suppliers. Blockchain technology anonymizes the data but it is still sufficient to ensure that the supply chain is up to standard. Not only can it help to monitor food ingredients, it can also monitor the conditions at the production facility. These are often very difficult to verify and, even if records are taken, they can be falsified. A photo or digital file can be taken to record the situation, such as a fish being caught, to show that it complies with the MSC’s regulations on sustainably caught seafood. Food and beverage manufacturers can also use blockchain to ensure that conditions at their production facilities are being met, or any other data that needs to be securely transferred along the production line. While we are not yet advanced enough with this technology to implement across all food and beverage supply chains, increased digitalization and being at the forefront of investment into these technologies will help plant managers to prepare their supply chain against the food fraud threat. * The Wikipedia entry on Blockchain! Simulating agricultural climate change scenarios. To fully understand the effects that changes in temperature, CO2, and water availability caused by climate change may have on crop growth and food availability, scientists often employ controlled growth chambers to grow plants in conditions that simulate the expected atmospheric conditions at the end of the century. Growth chambers enable precise control of CO2 levels, temperature, water availability, humidity, soil quality and light quality, enabling researchers to study how plant growth changes in elevated CO2 levels, elevated temperatures, and altered water availability. Over the past 30 years, there have been several attempts to more closely simulate climate change growing scenarios including open top chambers, free air CO2 enrichment, temperature gradient tunnels and free air temperature increases, though each of these methods has significant drawbacks. Growth chamber and temperature gradient greenhouses offer increased working area compared with traditional growth chambers, enabling them to work as greenhouses without the need for isolation panels, while still enabling precise control of CO2 concentration, temperature, water availability, and other environmental factors. Such greenhouses have been used to study the potential effects of climate change on the growth of lettuce, alfalfa, and grapevine. For researchers to study the effects of climate change on plant growth using growth chambers or greenhouses, highly accurate CO2 measurements are required. The Guardian NG from Edinburgh Sensors provides accurate CO2 measurements in research greenhouses mimicking climate change scenarios. The Edinburgh Sensors Guardian NG provides near-analyzer quality continuous measurement of CO2 concentrations. The CO2 detection range is 0-3000 ppm, and the sensor can operate in 0-95% relative humidity and temperatures of 0-45 °C, making it ideal for use in greenhouses with conditions intended to mimic climate change scenarios. Furthermore, the Guardian NG is easy to install as a stand-alone product in greenhouses to measure CO2, or in combination with CO2 controllers as done by the Spanish team in their growth control and temperature gradient greenhouses.4,6 Conclusions Simulating climate change scenarios in with elevated CO2 concentrations is essential for understanding the potential effects of climate change on plant growth and crop yields. Accurate CO2 concentration measurements are essential for such studies, and the Edinburgh Sensors Guardian NG is an excellent option for researchers building research greenhouses for climate change simulation. https://www.co2.earth/2100-projections Accessed September 7th, 2017. Morales F, Pascual I, Sánchez-Díaz M, Aguirreolea J, Irigoyen JJ, Goicoechea N Antolín MC, Oyarzun M, Urdiain A, ‘Methodological advances: Using greenhouses to simulate climate change scenarios’ Plant Science 226:30-40, 2014. Aguirreolea J, Irigoyen JJ, Perez P, Martinez-Carrasco R, Sánchez-Díaz M, ‘The use of temperature gradient tunnels for studying the combined effect of CO2, temperature and water availability in N2 fixing alfalfa plants’ Annals of Applied Biology, 146:51-60, 2005.
https://edinburghsensors.com/products/gas-monitors/guardian-ng/ Accessed September 7th, 2017. Measuring CO2 to optimise bulk storage of food. One of the major reasons for lost grain is spoilage due to mould or insect infestation during storage.2 To provide a constant supply of grain year-round, after grains are harvested they are often kept in long term storage. Maintaining the quality of stored grain is crucial, both to ensure the quality of the final food products, and to prevent economic losses for farmers. Research published by Purdue University and Kansas State University have confirmed that high CO2 levels detected by stationary and portable devices are associated with high levels of spoilage and the presence of mycotoxins.4,5 Furthermore, they compared the ability of temperature sensors and CO2 sensors in a storage unit filled with grain to detect the presence of a simulated ‘hot spot’ created using a water drip to encourage mould growth. To enable efficient monitoring of grain spoilage accurate, reliable and simple to use CO2 detectors are required. Gascard NG Gas Detector from Edinburgh Sensors provide accurate CO2 measurements along with atmospheric data, enabling grain storage managers to make decisions with confidence. The Gascard NG Gas Detector uses a proprietary dual wavelength infrared sensor to enable the long term, reliable measurement of CO2 over a wide range of concentrations and in temperatures ranging from 0-45 °C. Measurements are unaffected by humidity (0-95% relative humidity) and the onboard pressure and temperature sensors provide real-time environmental compensation, resulting in the most accurate CO2 concentration readings. Kumar D, Kalita P, Reducing Postharvest Losses during Storage of Grain Crops to Strengthen Food Security in Developing Countries. Foods 6(1):8, 2017.
http://www.world-grain.com/Departments/Grain-Operations/2016/7/Monitoring-CO2-in-stored-grain.aspx?cck=1 Accessed May 25th, 2017. HGCA Grain storage guide for cereals and oilseeds, third edition, available from: https://cereals.ahdb.org.uk/media/490264/g52-grain-storage-guide-3rd-edition.pdf Accessed May 25th, 2017. Maier DE, Channaiah LH, Martinez-Kawas, A, Lawrence JS, Chaves EV, Coradi PC, Fromme GA, Monitoring carbon dioxide concentration for early detection of spoilage in stored grain. Proceedings of the 10th International Working Conference on Stored Product Protection, 425, 2010. Maier DE, Hulasare R, Qian B, Armstrong P, Monitoring carbon dioxide levels for early detection of spoilage and pests in stored grain. Proceedings of the 9th International Working Conference on Stored Product Protection PS10-6160, 2006. Ileleji KE, Maier DE, Bhat C, Woloshuk CP, Detection of a Developing Hot Spot in Stored Corn with a CO2 Sensor. Applied Engineering in Agriculture 22(2):275-289, 2006. Application for Mass flow measurements for those over 18 years old! When thinking of alcoholic products that are produced in Britain, a fine malt Whiskey may spring to mind or perhaps beer brewed in one of the numerous breweries that can be found dotted around the country. How many people however, would immediately think of Vodka? Well, nestled in the Herefordshire countryside, the family run Chase distillery (entry only to over 18 year olds!) thinks a lot about Vodka, in fact it produces the award winning Chase Vodka which is the World’s first super premium English potato Vodka. The entire process from seed to bottle takes place on the Chase estate ensuring that a close eye can be kept on all stages from growing the potatoes to distilling and bottling. It was at the distilling stage that Chase was looking for a flowmeter that was capable of measuring the flow rate of fermented potato mash. After careful consideration, they decided on Krohne’s OPTIMASS 1300 Coriolis mass flowmeter. The fermentation process is started with the mashing of potatoes and the addition of a brewer’s yeast. After about a week, the fermented potato mash is distilled four times in a bespoke copper batch pot and then twice more in a rectification column. It is here that the OPTIMASS 1300 is installed in a vertical pipe run feeding the distillation column. The density of the medium going through the meter can vary from 0.95 to 1.1kg/litre and flows at a rate of 2000 l/hr with pressure of 1BarG at a temperature of 30⁰C. With the available space being limited, Chase required a meter that had a small installation envelope, but could still measure accurately and was capable of being CIP cleaned at 65⁰C. The OPTIMASS 1300 has a dual straight tube design which makes it ideal for use in hygienic applications as there are no crevices or bends for bacteria to gather and the meter can be easily drained and cleaned. Due to the hygienic nature of the application the OPTIMASS 1300 was supplied with hygienic fittings and also has all of the necessary hygienic industry approvals. 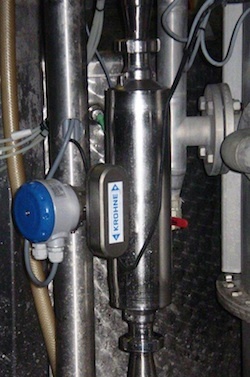 Prior to installing the OPTIMASS 1300, Chase used a manual method to monitor the flow of fermented potato mash into the distillation column, however they were looking for a mass flow meter to automate the process. The OPTIMASS 1300 has enabled Chase to monitor the feedstock to finished product ratio accurately and since installation it has also reduced production time by highlighting an underperforming feed pump that was increasing the mash charging time which in turn lengthened the production time. Initially, the OPTIMASS 1300 will be used with a local display, however in the future it is planned to interface the meter with the PLC using mA outputs to measure volumetric flow, density and temperature.